This is a wonderful recipe. Perfect for a very special dinner for two or a flash dinner party. Notwithstanding its fabulous appearance, it is extremely easy to prepare. All you have to do at the last minute, is cook the lamb which is minimal hands-on work. If you haven’t used sumac, don’t be overwhelmed by the amount. It is not overpowering. The first time I made this recipe I was really nervous but quickly learned the dish can cope with a good coating of sumac on the lamb. Lamb back strap is expensive. If you can’t bring yourself to spend that sort of money, consider lamb fillets or lamb rump. One backstrap was enough for Maus and me. If using fillets, you will need two. I am afraid I can’t remember the source of this recipe. It is one that I cut out of a magazine long ago. Mix yoghurt with a pinch of salt. Place in a colander that has been lined with a moist cloth, tie cloth and allow to drain for several hours. Chop the mint and mix through the labne. Set aside. Saute the onion until soft and translucent. Do not brown. If need be, add a bit of water to stop the onion sticking. Add the garlic and spices and sauté for 2 minutes. Simmer for 15-20 minutes or until the sauce has thickened slightly. Add the dates and chickpeas. Stir to combine. Trim the lamb of sinew then roll it in the sumac. Add the lamb and sear on both sides. Place pan in a hot oven (220°C) for approximately 15 minutes (my lamb ended up well done – if you like it rare, reduce the time). Remove from oven and allow to rest in a warm place. Place a mound of the chickpea braise in the centre of each plate. Slice the lamb and place on top of the chickpea braise. Place a dollop of labne on the lamb. Sprinkle with fresh parsley and some pomegranate seeds. 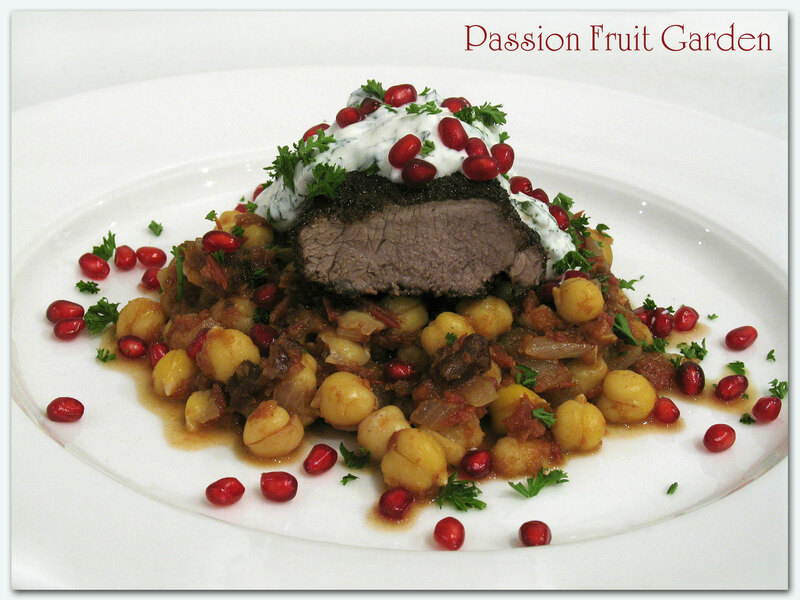 This entry was posted in Eating your bounty, Lamb, Pomegranates, What's for dinner? by Glenda. Bookmark the permalink. Yes, what a perfect recipe…I could almost taste it! 🙂 will save for later use! Hi Laila this is one of my favourite dishes. Sumac is one of my favourite spices especially when its fresh and still very zingy! Try sprinkling it on buttery basmati rice next time a la Persian style, yum yum yum! Love the braised chickpeas, I could eat just them as a complete meal! Hi Lisa, I hope you are well. I don’t use sumac that much. Clearly I should use it more. I think this one is very special. I hope you enjoy it. Yes, i love sumac as well and use it a lot to marinate chicken and vegetable with. I love the sound of your dish and have bookmarked it! Hi Selma. I hope you enjoy it. Fabulous. I love the lemony tartness of sumac – and with lamb, it is perfect. Great recipe wherever it came from! Hi Debi, the first time I made this dish, which was many years ago, I had never used sumac. It was a dinner party and I was so nervous about what the sumac would taste like. All was well, it gave me confidence to use it with gay abandon.